I was encountered to search mysql table with ip address based on subnetmask information. This was part of the netflow tools for our internal use. I exported the flow data from flow-export to mysql database. I created the database "ip address" as Text.The built-in mysql function makes life easy to search the table. The generated number is always in network byte order. For the example just shown, the number is calculated as 209×(256^3) + 207×(256^2) + 224×256 + 40. To search subnet we need add relevant no # host data to the search. Then if i could write the query .. like this works fine..
May be there can be easy way. as usual i searched through process explore (sysinternal ) for any unwanted process + tcp connection, Nothing suspicious.But Anti-Virus  logs points out http.exe trying to access IRC ports http.exe is xammp apache server process. This setup explores the per connection queuing in the congestion situation and  how to utilize the priority queuing features. 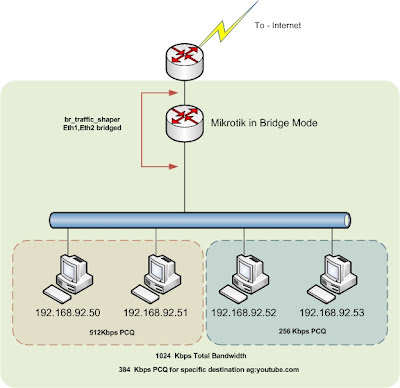 1) Bridge setup  - " Don't forget to enable the bridge firewall :) "
Day to Day -  Enjoying supporting and consulting Service Provider Segment in Cisco.